The result is a roof that is resistant to the elements, and which will go on protecting your property for many years to come. Why Choose Roofing Proffesionals for Your Torch-On Roofing? 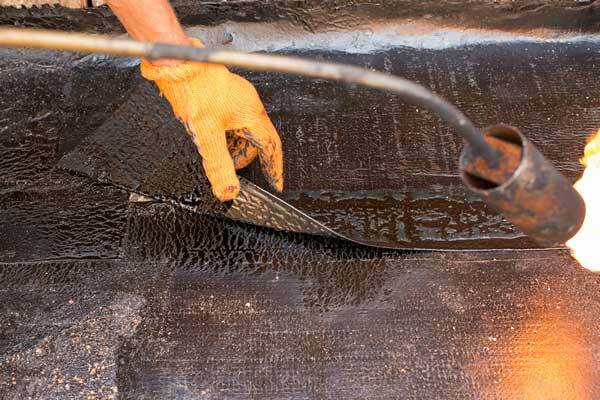 One of the most important considerations, besides quality, when applying roofing by torch is safety. It really is worth investing in a company like us fully experienced in this application and in the health and safety precautions involved. Whilst applying your new roofing system, we will work to a strict code of safety to ensure your roof is not only applied to the highest standard, but that no damage occurs to any part of your property – we have heard some horror stories over the years about jobs carried out by other local companies. Don’t leave your flat roofing to chance when we offer you professional service you can trust. Perhaps your roof has suffered storm damage, natural wear and tear, or you require a completely new replacement roof. Whatever you need, our torch-on roof services are some of the best in the region, and we would be delighted to provide you with more information. There are many cowboys in the roofing industry, looking to make a fast buck for very little in return. We do things differently here at Professional Roofing Specialists, and you’ll know you’ve chosen a professional company the moment you start working with us. We use only the best materials and equipment, and we work to a very strict code of safety, complying with the latest safety standards and legislation. Whether you are looking for emergency repairs or a complete roof installation, we are the company to call, and our friendly team is standing by right now to assist. Call us today for a cost effective quote and roof inspection. Contact us today on 0203 399 8190 for a free quotation from one our professionals. The roofers are highly skilled, fully qualified, and fully insured in the unlikely case of accidents. They will undertake everything from a small leak to a completely new roof with the utmost care and competence.